I consider myself extremely fortunate to have eaten a tidbit of a truffle a handful of times in my life. I can remember each of the dishes and restaurants in which I ate them too. I’m not talking about the chocolate kind, I’m not really a chocolate fan anyway, I’m talking about the fungus kind of truffles. 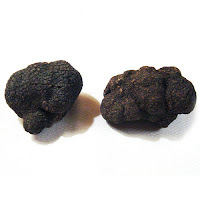 Most truffles are grown in the south of France, Italy and also in Spain. Apparently the soil there is perfect for growth, but France’s harvest is shrinking due to suburban sprawl. Truffles grow completely underground amongst oak and hazel trees, with the truffle supplying the trees with salt and the trees supplying the truffles with sugar. Specially trained dogs have to find the truffles from December through March. No fertilizer can be used on truffles, as the root system needs to develop. The last time I ate truffles, I remember thinking, why on earth doesn’t someone in America make truffles? We are the capitalists of the World, paying hundreds if not thousands of dollars a pound for these things. We have vineyards like the French, mustards like the French, why on earth can’t someone come up with a lucrative truffle farm like the French? Alas, I have found a genius who‘s working on it! Susan Rice of the Black Diamond French Truffles in North Carolina is one of only a handful of people in the US trying to cultivate truffles. Her farm consists of 300 acres in North Carolina, which will have 5596 trees at its peak. So far the investment in Susan’s effort to make North Carolina the American capital of truffles has been $25 million. Susan has lived in Pinehurst about twenty years, and has always loved cooking. In the past, she’s only received truffles as Christmas presents. Additionally, her son Corey studied biology of plants in college, and currently oversees the farm and the day to day operations. It will take three to five years before the truffles are produced. The company plans to grow, package and sell truffles worldwide to wholesalers and retailers. They are currently renovating a barn and farmhouse to handle the cleaning and distribution of the truffles. Additionally, plans are in the works to add a kitchen to offer cooking classes, a tasting room, a restaurant, a hotel room, and sitting rooms for visitors. Tours and tastings are set to begin this summer. I've been to Godiva, does that count?